Whoops! I missed the August Spend Report last month with all the hubbub that was going on so I thought I would post August and September next to each other. 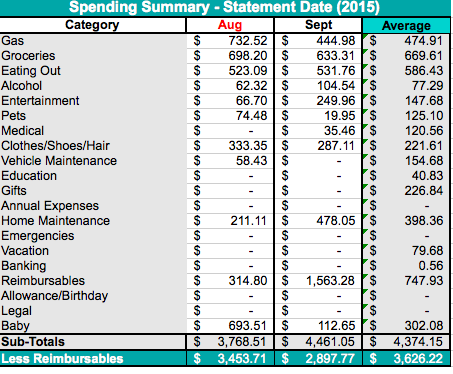 September of course marks a big shift in our spending habits mid-month. The last two weeks of September I haven't been working in an office, so no more temptation of the work cafeteria. I've also been in BC with my husband, so wayyyy less driving. I expect that October and November will show an even more drastic change. So you can see right away that we spent about $800 less than we usually do (referring to the total less reimbursables). There are no real surprises here - some spending for baby and home maintenance. The latter was a Costco run for my mom's place, some odds and ends from the hardware store and that sort of thing. 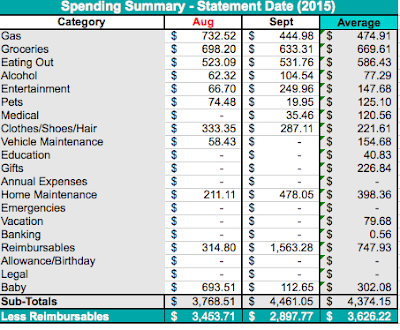 I'm looking forward to seeing the total spend be closer to $2,000 for the month of October. Some of you know that the company I used to work for has an employee ownership model. As part of that, I own shares worth $10,284.30 USD. If the USD/CAD conversation rates stay about where they are now, the refund should wind up being closer to $13,500 CAD. I should note that it is not an option to maintain my shares if I'm not an employee. As per my shareholder agreement, the company has up to six months from my departure to sell and issue a refund to me. I've confirmed that I will receive the money in USD in a cheque. So, sometime between now and the middle of February we'll get a cheque and need to have a plan for the money. I've always considered the money invested in shares part of my retirement plan, but now that the funds are being paid back, I'm feeling a bit torn. Jordan and I chatted about it over the weekend some and he's also a bit conflicted. Keeping the money fluid does have it's advantages. Certainly it would fully fund our emergency fund and then some. We don't know what type of job I'll find next year, so it might be good to have this as cash to remain flexible. This also opens us up to spending the money even if we don't really need to. Paying off the Kia is a super attractive option. The interest rate is 0%, and as of today we owe just over $15,000 on it - so it would be so so close to being paid off with the share money. We pay a little more than $250/month on the car and not having that payment would give us a different type of month-to-month flexibility. That money could be redirected to paying off the LOC - going from $500/month to $750/month, or directed to savings that we've had to pull back on because of going on EI. Putting the money towards this debt has the advantage that it can't be 're-spent' unlike the LOC. Paying a big chunk on the LOC would make tackling the rest of it feel actually achievable. Since using it to build the garage and fence on our Alberta house, the balance has gone up and down from $19K to about $25K. Currently it's sitting at $23,500 - so the share money would get this down to a manageable $10,000. The interest rate on the LOC is 5.73%, so from a financing charge perspective it makes more sense to lower this debt than the Kia as well. The minimum payment would reduce by about half which would give us equal month-to-month flexibility that paying off the Kia would give us (reducing the required paying by about $250). Last option would be to just move the money into RRSPs. This wouldn't impact our cash flexibility in anyway, but would lock in the money to long term savings which was the original intent of it. So, what do you think? Keep the money as cash, pay off debt, or move the money to long term retirement savings. We could really use your thoughts on this one. I've written about it before, about Employment Insurance, about preparing for the worst - but I've never actually experienced it. Many of you know that things are pretty rough in Alberta right now, with continued uncertainty around the oil & gas industry combined with mining - many organizations are struggling. My employer is no different. I've officially been let go. It's a pretty strange sort of feeling. I have known that things weren't great for a while now, but I had been hopeful that I would make it through. I did in the 2008/2009 recession, and I made it through a variety of restructures, but this time it just wasn't in the cards. So, here I am, starting my maternity leave a few weeks early, trying to figure out what to do with myself until baby arrives sometime next month. I've been pretty busy my first week with setting in to our place in BC, and generally getting ready for baby - but I imagine as the days go by I'll start to get a bit bored. We'll be alright financially, my employer has treated my really fairly and my maternity leave benefits won't be interrupted. I've got a decent severance package which will, when combined with my Mat Leave, will take me into early 2017 as it doesn't start until mat leave ends. I'm hoping to get writing a bit more frequently again, though I'm not sure how interested folks are in reading about baby stuff, but we'll see how it goes. Despite declines in the value of my pension and some of other other investments, we've had an increase in cash savings and the company shares I own which are in USD and so have gone up because of the exchange rate. That combined with steady re-payment of the mortgage, LOC, and vehicle means that we've had a steady increase in our overall networth.